A superpower leader takes a personal grudge against an Arab dictator and starts a war of regime change. A people rise up for their freedom, only to be crushed by a ruthless military assault. While these events would seem to be today’s headlines, they are, in fact, the basis of this fascinating book on two of the most critical weeks of the Cold War in late October and early November 1956. 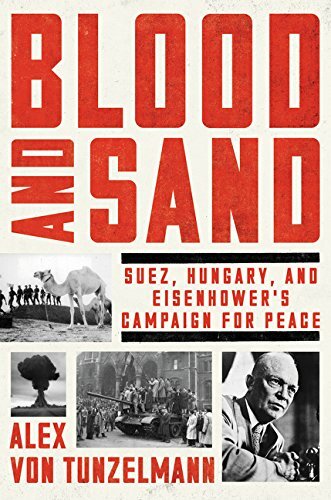 The Suez Crisis and the failed Hungarian Revolution of 1956 have mostly been studied by historians in isolation. This new book takes a much different approach, examining these events as a set of interrelated actions that not only caused one of the major flashpoints of the Cold War, but forever changed the status of Britain and France as world powers. The theme that ties this whole book together is the reaction of the United States to both these crisis. Led by the steady hand of President Eisenhower, America had to thread a very careful needle to manage both crises without accidently igniting war with the Soviet Union or carelessly antagonizing both our main allies and the Arab world. Given that Britain, France, and Israel deliberately tried to hide their war preparations from the United States, this effort clearly tested the long-term ties of each of these countries to the United States. Having experienced first hand the horrors of global war, Eisenhower handles the American response to these crises with surprising agility and firmness, even while he is campaigning for a successful re-election bid. Interestingly, the role of his Secretary of State, John Foster Dulles in both muddling and resolving these crises, shows that he often seemed to be either deliberately or negligently working at cross purposes with his President. Although some readers may continue to ask why more was not done to support the Hungarians, a discerning reader will realize that the U.S. recognized the clear limits of its power in Europe at the time. Clearly our NATO allies were not going to war to free Hungary, and the potential for misunderstanding escalating to a nuclear exchange was always in the back of every leader’s mind. The main character in the misbegotten Middle East war is Sir Anthony Eden, Britain’s Prime Minister. Caught in the tumult of a disintegrating British Empire and the rise of a bipolar world, he comes across as a malevolent but tragic figure, unable to exercise the influence over the Arab world that Britain once had, and reluctant to acknowledge the Britain was becoming a second-tier world power. Combined with the misspent effort by Britain and France to maintain their overseas empires against indigenous populations and the stage is set for one of the most politically and militarily disastrous wars of the 20th century. Hungary is a different story. The Iron Curtain was anything but in the 1950s, with riots and rebellions of various intensities in East Germany, Poland, and Hungary as the populations of these countries tried in vain to end the occupation of the Soviet Red Army and the increasingly brutal Communist regimes supported by their Communist masters in Russia. Begun as a series of protests by students and workers, the Hungarian Revolution appeared to bloom in spite of an initial crackdown by the Red Army and Hungarian Secret Police. The uncertainty and hesitation of the Russian leadership in dealing with open rebellion showed their paralysis in acknowledging a genuine uprising, especially as the new Soviet leader, Nikita Khrushchev, had only recently denounced Stalinist hardline tactics. Convinced that the rebellion must have been fermented and fostered by the West, they finally decide to send in the might of the Red Army while saber rattling against NATO, highlighting the genuine danger that existed for an accidental war in Europe, given the lack of communication and ability to determine the intentions of the other side. Ultimately, although the Hungarian rebellion was crushed under the treads of Red Army tanks, the long-term seeds to the eventual rise of the Prague Spring in 1968 and Solidarity in Poland in the 1970s would be planted in the streets of Budapest. The resolution of the Suez Crisis was a more critical issue. The wielding of American economic and political power to end the war before our allies achieved their military and political goals marked a watershed moment in trans-Atlantic relations and the final retreat from Empire and colonialism for both Britain and France. Within 10 years, nearly all of the remaining British and French colonies would be independent, and Nasser would continue to be the dominant political figure in the Middle East until his death in 1970. This is a very timely book about two of the most critical weeks of the Cold War. The global balance of power was never really the same after the Suez or Hungarian Crisis, as former colonial empires gave war to nuclear armed super powers and a Europe increasingly divided into bipolar spheres of influence that would remain unchanged for the next 40 years.